At most morning markets in Thailand, and even in local neighborhood 7-11 shops, a "Tom Yum Kit" is sold containing a handful of lemongrass, galangal, chiles, lime leaves, and if you're lucky a lime or two. Sold in a plastic bag, ready to take home and cook up your own tom yum soup. Here we have a nice variety of excellent quality fresh Thai herbs shipped to you via 2-3 Day Priority for a really great price. 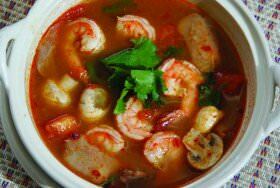 It's not too common that in the middle of winter we have such an abundance of great quality fresh tom yum ingredients. You get 8 stalks of fresh lemongrass, a handful of fresh red Thai chiles (about 6 oz), a handful of fresh lime leaves (at least 1 oz, about 40 leaves), a small chunk of fresh galangal (4-6 oz), and three fresh limes. We will usually have either green or a mix of red/green Thai chiles, not all red. All for $24.95 and that includes Priority shipping. You can't find a better deal anywhere. 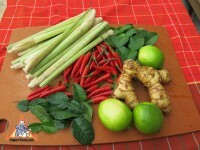 See our video from a "railroad chef" for a nice short tutorial on how to make fresh, extremely tasty tom yum in minutes using these essential ingredients. Suggest you add a Yellow Label Tom Yum as well. Please Note: Produce ships via USPS (2-3 Day) so please provide an address that can be used for USPS delivery. If you order only fresh produce, select "$0.00" as shipping charge at checkout (because the price below includes shipping). If you order fresh produce and any other items, you must checkout with "Fedex Ground" as the shipping method. Any questions about shipping, if you need a definite delivery date, delivery times, or anything else please feel free to call toll free 888-618-THAI.